Russia fired on and then seized three Ukrainian navy ships in the Black Sea close to Crimea on Sunday, injuring six crew members, according to Ukraine, marking a sharp spike in tensions between the two countries and raising fears of escalation. In a statement posted on its Facebook page, Ukraine’s navy said that ships belonging to Russia’s FSB border service had opened fire on two small armored artillery boats and a tug accompanying them. It said the Russian fire had immobilized the two artillery boats and that Russian special forces had then boarded and seized them, injuring six Ukrainian sailors. Russia’s FSB confirmed that it had seized the three Ukrainian ships and had used weapons to stop them. In a statement, the agency said three Ukrainian sailors had been hurt, but that their injuries were not life-threatening and that they were receiving treatment. In response to the incident, Ukraine's president Petro Poroshenko summoned an emergency session of his military cabinet and announced that he would propose introducing martial law. Speaking after the session, Poroshenko said he would request Ukraine’s parliament vote on the measure on Monday. However, he noted that martial law would not mean a full-scale mobilization of Ukraine’s armed forces or that it would conduct offensive operations. The seizure of the ships marked a drastic escalation in what has been a simmering dispute between Russia and Ukraine over access to the waters around Crimea, one triggered by Russia’s annexation of the peninsula in 2014. For months, Russia and Ukraine have been sparring with one another around access through the Kerch Strait, a narrow stretch of water that separates the Russian mainland from Crimea. The strait is the only way into the Sea of Azov and a 2003 treaty between Russia and Ukraine defined both it and the sea as shared territorial waters. However, since Russia’s seizure of Crimea, it has recently sought to exert greater control over the strait, with Ukraine frequently accusing Russia of harassing and blocking its ships. The conflict has worsened since Russia completed a bridge spanning the strait. On Sunday, that conflict boiled over. 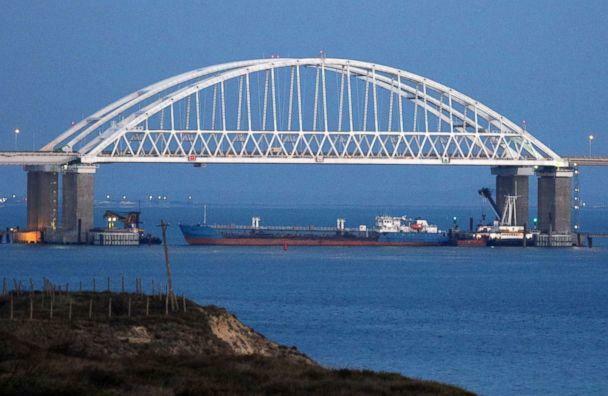 The FSB said it had seized three Ukrainian ships because they had refused demands to stop and had unlawfully entered Russian waters as they tried to cross through the Kerch Strait. Ukraine disputed that, saying that it had informed Russia of the ships’ itinerary and accused Moscow instead of deliberate aggression against them. As they headed towards the strait, the Ukrainian ships were met by Russian coast guard vessels. 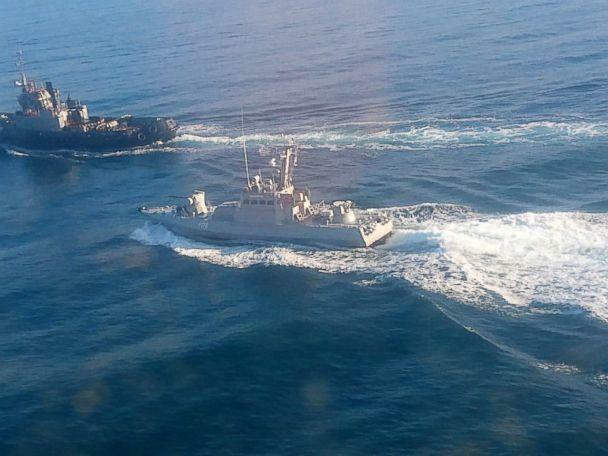 Photographs released by the FSB’s Crimean branch showed the Russian ships cutting in front of the Ukrainian boats. Ukraine then accused one of the Russian ships of ramming the tug accompanying the two warships, damaging its engine and a lifeboat. As the incident escalated on Sunday, Russia blocked access to the strait by parking a tanker in it. Dozens of cargo ships wanting to pass through were now backed up, according to The Associated Press. The incident set off fears that it could see a wider escalation in Ukraine’s conflict with Russia that began four years ago with Crimea’s annexation and later became a bloody war in eastern Ukraine, after Russia supported separatist rebels there, covertly sending in its own troops to fight. Nikki Haley, the U.S. ambassador to the United Nations, announced on Twitter that the U.N. Security Council would hold an "emergency meeting" on the issue Monday. The European Union and NATO on Sunday called for Russia to immediately stop blocking access through the Kerch Strait and urged both sides to show restraint. Russia’s foreign ministry spokeswoman, Maria Zakharova, accused Poroshenko and Ukraine of inciting the incident as a deliberate provocation, describing them in a statement as behaving like a "highwayman." Following his war cabinet meeting, Poroshenko emphasized that "immediate mobilization" would not follow if martial law was approved and said that it would not curtail Ukrainians’ rights and freedoms. Some commentators in Ukraine quickly noted that martial law could mean the postponement of the country’s presidential elections, which are due to take place in March and in which Poroshenko is currently facing dire polling numbers. The war in eastern Ukraine, which has claimed over 10,000 lives, has remained at a low-boil since a peace agreement was reached in 2015. Almost daily shelling nonetheless continues along the frontline and civilians and soldiers are still frequently killed.